'Lethal Defensive Weapons' One Option In Ukraine, Obama Says : The Two-Way The president said the option was one of many he was considering if diplomacy fails. Germany's chancellor, who held a joint news conference with the president, backs diplomacy to end the crisis. 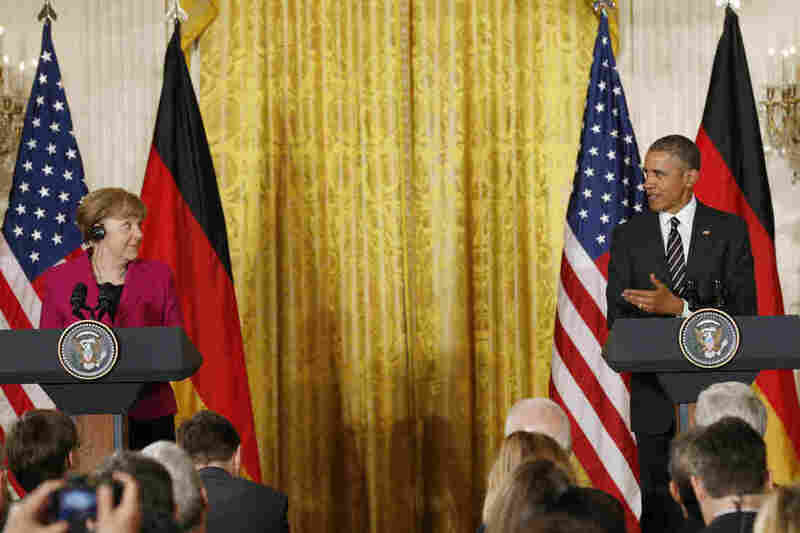 President Obama and German Chancellor Angela Merkel hold a joint news conference at the White House on Monday. President Obama said "lethal defensive weapons" to Ukraine is one option being considered by the White House if diplomacy with Russia fails to end the fighting that pits Ukrainian troops with pro-Russia separatists. "If, in fact, diplomacy fails, I've asked my team to look at all options, what other means can we put in place to change Mr. [Vladimir] Putin's calculus," Obama said in a joint news conference at the White House with German Chancellor Angela Merkel. "And the possibility of lethal defensive weapons is one of those options that's being examined. But I have not made a decision on that yet." Germany and other European countries are against arming Ukraine, preferring to rely solely on diplomacy and other means of pressure. Merkel said Russia had "has violated the territorial integrity of Ukraine." She added: "For somebody who comes from Europe, I can only say, if we give up this principle of territorial integrity of countries, then we will not be able to maintain the peaceful order of Europe that we've been able to achieve. This not just any old point: it's an essential, a crucial point, and we have to stand by it." Today's comments follow news that the sides will restart talks for peace in Ukraine. As NPR's Scott Neuman reported Sunday, "If all goes to plan, Merkel will join Russian President Vladimir Putin, Ukrainian President Petro Poroshenko and French President Francois Hollande in the capital of Belarus on Wednesday." The conflict in Ukraine, which began last April, has killed more than 5,300 people; the fighting has spiked over the past two weeks. Russia is under U.S. and EU sanctions for its role in the crisis, but that has not resulted in a let up in the fighting. Merkel acknowledged that talks with Russia may not work, but "I myself actually would not be able to live with not having made this attempt." "But if, at a certain point in time, one has to say that a success is not possible, even if one puts every effort into it, then the United States and Europe have to sit together and try and explore further possibilities, what one can do," she said. Merkel and Obama are discussed the threat posed by the self-described Islamic State, with Obama vowing to "destroy this barbaric organization." Germany is equipping Kurdish forces in Iraq and is preparing to lead the training mission of local forces in Irbil, Obama said. They also discussed Iran's nuclear program and Afghanistan.